Summerset Isles is also rumored to be the newest chapter. 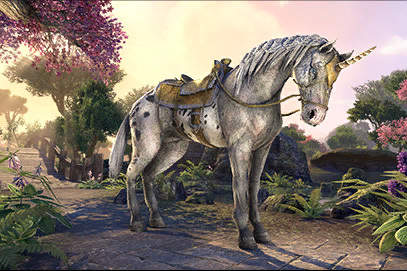 Very exciting for us Altmer players, and the new non combat pet ponies are adorable. I’m CP 420+ now and don’t have trouble in Vet, so am feeling pretty good about it. I’ve also (somewhat) finished Morrowind & Clockwork City, which was really nice to return to and I am three Cyrodill skyshards & delves away from completing some major achievements with some awesome dyes I’m so pumped to get. I’m excited for February as the new Outfit system will make it easier for me to make outfits to upload. Not to mention housing storage which will ease the pain of my overflowing inventory. I’ve been thinking about ESO a lot lately, as I level more alts I’m intrigued about future skill lines, classes, zones & even races that might be added. I’m starting to feel like I’ve played so much of this game that I’m so eager for more new content. This entry was posted in Blog, News, Uncategorized and tagged Datamining, Masqued Unicorn Mount.